Which Fireplace Is Best For You? CHIM CHIM CHER-EE… Which Fireplace Is Best For Me? “A sweep is as lucky, as lucky can be…” But, actually, the person that has his/her chimney swept out is the lucky one! Chimney sweeps are the people who clean ash and soot from chimneys. Chimneys may be straight or contain many changes of direction. During normal operation, a layer of creosote builds up on the inside of the chimney restricting the flow. The creosote can catch fire, setting the chimney and even the building on fire. The chimney must be swept to remove the soot. This is done by a chimney sweep. Today, just as in the days of hundreds of years ago, chimney sweeps are still operating, as venting systems for coal, heating oil, natural gas, wood and pellet burning appliances still need to be maintained. There is a greater understanding of the dangers of flue deposits and carbon monoxide and gases from combustion. The standard chimney brush is still used, along with more modern tools (such as vacuums, cameras and special chimney cleaning tools). Most sweeps are done from the bottom of the chimney, rather than the top, to prevent the dispersion of dust and debris. Most modern chimney sweeps are professionals, and are usually trained to diagnose and repair hazards along with maintenance such as removal of flammable creosote, firebox and damper repair, and smoke chamber repair. Some sweeps also offer more complicated repairs such as flue repair and relining, crown repair, and tuckpointing or rebuilding of masonry chimneys. For all you lucky people that live in the greater Dallas/Fort Worth, Texas area, First Choice Chimney is the only business you will need to contact for all of your natural gas, wood burning, pellet, heating oil and wood burning chimneys and fireplaces. First Choice Chimney works in North Texas, Fort Worth, Dallas, Plano, Frisco, Lewisville, Keller, Las Colinas Weatherford, Aledo, Azle, Decatur, Mineral Wells, Cresson, Benbrook, Granbury, Tarrant County, Wise County, Parker County and all outlying areas. We specialize in gas fireplace inserts and installations. We also excel in chimney inspection, chimney liner installation, chimney caps, chimney crowns, dampers and chase covers. Everything we do is to make sure of fireplace maintenance in your home to keep it in tip-top shape and help keep it safe, warm, clean and healthy for you and your family. A fireplace is an architectural structure made of brick, stone or metal designed to contain a fire. Nowadays, fireplaces are used for the relaxing ambiance they create and for heating a room. First Choice Chimney is fully committed to work with all modern fireplaces with variable heat efficiency, no matter how sophisticated the design. Historically they were used for heating a dwelling, cooking, and heating water for laundry and domestic uses. A fire is contained in a firebox or firepit; a chimney or other flue allows exhaust to escape. On the exterior there is often a brick crown, in which the brick acts as a drip course to keep rainwater from running down the exterior walls. A cap, hood, or shroud serves to keep rainwater out of the exterior of the chimney; rain in the chimney is a much greater problem in chimneys lined with impervious flue tiles or metal liners than with the traditional masonry chimney, which soaks up all but the most violent rain. Some chimneys have a spark arrestor built into the crown or cap. 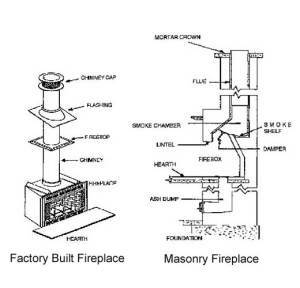 Masonry fireplaces are made from brick or stone. They can be fueled by wood, natural gas, biomass and propane fuel sources. Manufactured fireplaces are made with sheet metal fire boxes. These also can be fitted to burn wood, natural gas, propane, and other types of fuel. Electric fireplaces can be built-in replacements for wood or gas or retrofit with log inserts or electric fireboxes. These are the only fireplaces that do not need maintenance such as chimney and flue cleaning. These types of fireplaces are usually for ambiance only, but some do have electric heaters installed to help heat the room they are installed in. Ventless Fireplaces (duct free/room-venting fireplaces) are fueled by either gel, liquid propane, bottled gas or natural gas. In the United States, some states and local counties have laws restricting these types of fireplaces. They must be properly sized to the area to be heated. There are also air quality control issues due to the amount of moisture they release into the room air, and oxygen sensor and carbon monoxide sensors are safety essentials. These fireplaces are fueled by either liquid propane or natural gas. They are completely sealed from the area that is heated, and vent all exhaust gasses to the exterior of the structure. However, these chimneys need to be cleaned periodically and this is when First Choice Chimney will serve you well. Unless you really enjoy snow-related activities, winter is pretty terrible. One of the small consolations to this seemingly endless season is the feeling of curling up in front of a nice fire on a cold winter’s day. According to Realtor.com, fireplaces are actually a very popular selling point for new home buyers, regardless of whether they’ll be used. They’re very aesthetically pleasing and the mantle is a great place to display family photos and accomplishments. But if you live in a colder climate, your fireplace might be used for heat generation, in addition to pretentiousness and senior portraits. Therefore, what your fireplace uses as fuel is probably important to you. If you live in the greater Dallas/Fort Worth area, and you have any questions at all about any type of fireplace you have and any type of fuel you may use, just call us: First Choice Chimney at (817)-791-4606. We service all and will be happy to help you with any questions you have. A gas fireplace is as easy as flipping a switch. Boom. Instantaneous fire. Wood-fueled fireplaces require a lot more effort to get going. First you have to get the wood, then you have to arrange it a certain way, get kindling, start the fire and then maintain it. A wood-fueled fire is like a living organism that needs to be created and sustained. That’s great if you want the satisfaction of building something. But if you’re cold or just want a fireplace to look at, choose gas. Sure, you can buy firewood from a hardware or home improvement store. Or, you can just walk into the middle of the woods, chop down a tree and use that for fuel. It’s a lot more difficult to produce your own natural gas, unless you’re eating a lot of beans, and you don’t want to power a fireplace with that kind of natural gas. Natural gas isn’t expensive, relatively, but it’s more expensive than free or the cost of a few logs. The aftermath of a wood-fueled fire is not fun to clean. The soot, ash and burned-out logs are messy and spread very easily. Creosote, a byproduct of wood-fueled fires can build up in your chimney and need to be removed by a professional. If you don’t regularly maintain your chimney when you have a wood-fueled fireplace, you risk a chimney fire. Gas fireplaces are as easy to maintain as they are to operate. No messy cleanup and no sweeping are necessary, though you might want to have a professional look at it every once in awhile. Granted, gas log fireplaces are as easy to use as opening a valve, but something’s missing. Sure, it generates heat and looks like a “traditional” fireplace, but it’s just not the same experience. Where’s the snap and crackle of the logs as they heat up? Where’s the intoxicating aroma of a wood fire? As far as the experience goes, a wood fireplace is the only fireplace in my book. On paper, it may appear as though it’s a split decision between wood and gas. But in practice, the benefits of a gas fireplace far outweigh the ambiance and free fuel. If you’re a casual fireplace user that just wants to turn it on a couple times per year for family photos or a romantic evening, gas is the way to go. After all, why clean up the mess of wood and ash if you are only burning a fire a couple of times a year? What do you think? The natural charm of wood, or the convenience of gas? Let us know, First Choice Chimney, which is your favorite, gas or wood. We at First Choice Chimney like gas, but we service all. Please call us first for all your fireplace needs at 214-960-5560 / 817-791-4606. Chim chim-in-ey, chim chim-in-ey Chim chim cher-oo! Good luck will rub off when we shake hands with you.